Fantastic book. This is the best of the three. Exciting, lots of relationship building, and how can you not love Finnick? 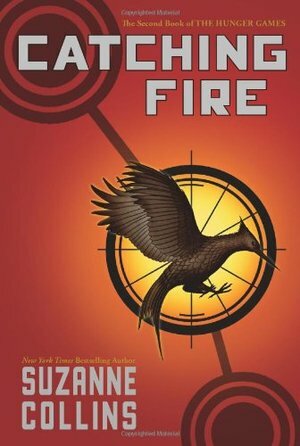 The 2nd installment of the Hunger Games series did not disappoint.... sort of. It contained its share of plot twists and violence. However, it was a lot slower than the first book and I was looking for more than just the love triangle that had emerged. In this book we do learn more about the mental strength of Katniss. She is tougher than before and toys with the reader's (and Peeta's) emotions. We learn just how deceiving Katniss can be, albeit out of necessity. Her need to convince everyone of her love for Peeta even seems to confuse herself. While it may be a bit of a stretch I would use this book to discuss some of the social aspects of high school that put stress on students. Perception is an enormous part of a high school students' life. Many are constantly on guard of trying to make sure they look or act cool, are keeping up with the current trends, and always make sure they associate with people that everyone else has deemed "cool". I would use this book as a discussion piece with my students. For example, "How many of you have pretended to like someone or were nice to someone in hopes of getting something out of it?" Just like Katniss pretended to love Peeta to continue to receive support and to keep the Capital from harming her for being the face of the revolution that was emerging. While I didn't find this book to be as good as the first, I would recommend it. I just hope that. The third installment will be better.